Are you frustrated with your Hip pain that is not getting better? Are you experiencing Hip discomfort after prolong walking, quatting or running? Walking in limping or imbalance? You are in the right place! We will definately be able to help with our innovative and non-invasive (non-surgical) form of treatment. Get your hip check today. Call us at (+65) 6471 2674 to schedule for an appointment. Hip pain is a common problem, and it can be confusing because there are many causes. It is important to make an accurate diagnosis of the cause of your symptoms so that appropriate treatment can be directed at the underlying problem. Arthritis – Arthritis is among the most frequent causes of hip pain, and there are many treatments available. If conservative treatments fail, hip replacement surgery is an option. Trochanteric Bursitis – Trochanteric bursitis is an extremely common problem that causes inflammation of the bursa over the outside of the hip joint. Tendonitis – Tendonitis can occur in any of the tendons that surround the hip joint. The most frequently encountered tendonitis around the hip is iliotibial band (IT band) tendonitis. Osteonecrosis – Osteonecrosis is a condition that occurs when blood flow to an area of bone is restricted. If an inadequate amount of blood flow reaches the bone, the cells will die and the bone may collapse. One of the most common places for osteonecrosis to occur is in the hip joint. Lumbar Pain – Referred Symptoms – Many back and spine problems can cause symptoms around the buttocks and hip. 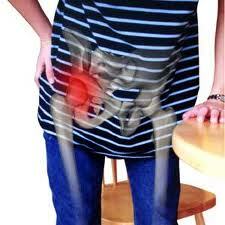 The most common problems that refer pain to the hip region are herniated discs and sciatica. Snapping Hip Syndrome – Snapping hip syndrome is a word used to describe three distinct hip problems. The first is when the IT band snaps over the outside of the thigh. The second occurs when the deep hip flexor snaps over the front of the hip joint. Finally, tears of the cartilage, or labrum, around the hip socket can cause a snapping sensation. Hip Fracture – Hip fractures are most common in elderly patients with osteoporosis. Treatment of broken hips requires surgery to either replace the broken portion or repair it with a metal plate and screws. Stress Fracture – Stress fractures of the hip are most common in athletes who participate in high-impact sports, such as long distance runners. Treatment usually is successful by avoiding the impact activities. People often decide to seek care after an injury based upon their ability to stand, bear weight, and walk. If there is a concern that a bone is broken, medical care should be sought in an urgent manner. Since patients with a broken hip tend to have significant pain even with minimal movement, it may be wise to seek professional treatment in lifting and transporting the fall victim.